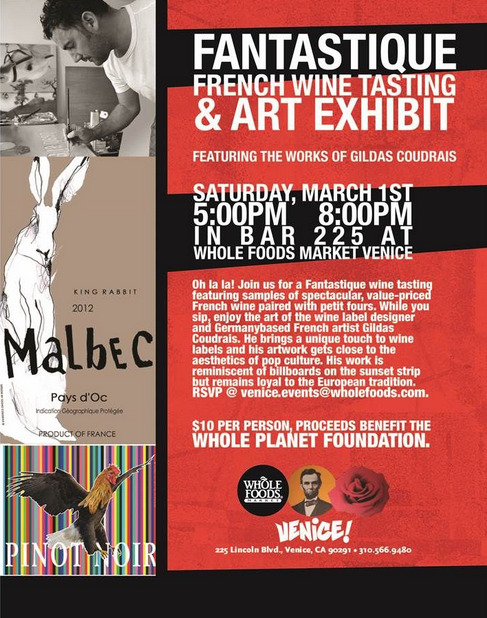 Art and wine goes hand in hand and this Saturday, March 1, 2014, from 5-8 pm you can attend an event at Whole Foods Venice to benefit the Whole Planet Foundation. The wine tasting will feature samples of spectacular value-priced French wine paired with petit fours. You will enjoy the art of the wine label designer and Germany-based French artist Gildas Coudrais. I am a sucker for labels that pop and are unique. 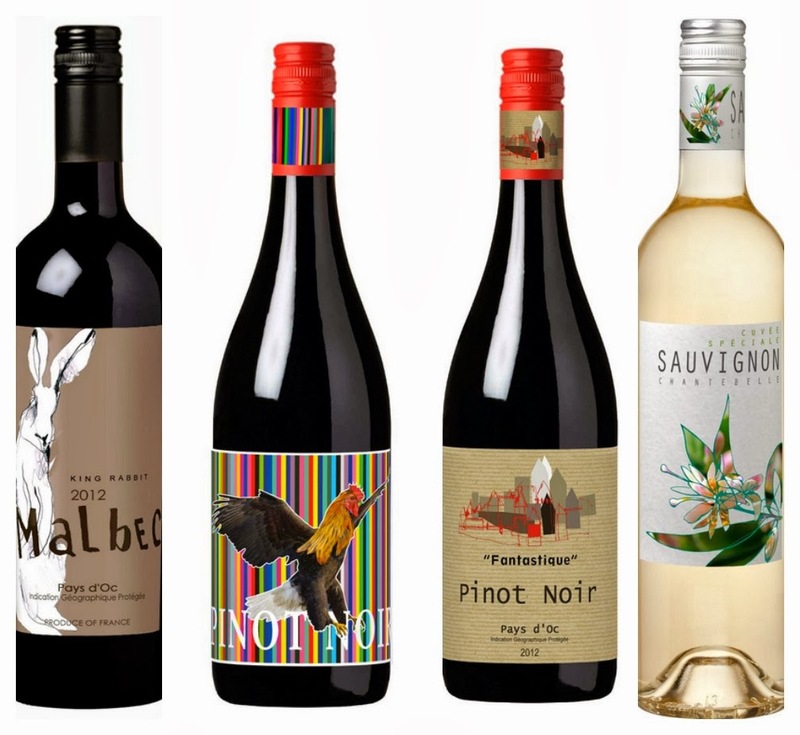 Coudrais brings a unique touch to wine labels and his artwork gets close to the aesthetics of pop culture. His work is reminiscent of large billboards on the Sunset Strip but remains loyal to his European tradition. He experiments with a wide-ranged repertoire of history of art, which he combines with quotations from media, advertising and poetry. A bright and brisk beauty with crisp citrus flavors, it's sensational start to the evening, especially with chilled shrimp and goat cheese! Rich, black plums, berries and cherries dance smoothly on the palate, hoping to get a turn with roasted duck, beef, or rabbit! A fantastically bolder Pinot, with flavors of spiced black cherries that would love to meet up with some cedar-plank grilled salmon or a French dip sandwich! The prices are amazing and the artwork is delightful so much so that these are perfect to gift any time on a whim. I love the King Rabbit Malbec and Chantebelle Sauvignon Blanc myself and for my friends. How fun is the rabbit design, especially since Easter is coming up! Make sure to attend this delightful evening and enjoy yourself. It's just $10 per person and the proceeds will be benefiting the Whole Planet Foundation. Connect with Whole Foods Venice on Facebook and Twitter! this would be so fun to go too. we have several events like this around the area and I hope to go to one some day. great way to spend time with friends and enjoy great art!